Phew! It was close, we almost missed our connecting flight. Our British Airways airplane was doing some aeronautical graffiti in the London sky, much like a bee circling over London a few times before it finally landed in the busy Heathrow airport. We arrived 7:30 London time, about an hour late relative to the scheduled arrival time. This puts some pressure on catching our connecting flight to New York, scheduled to depart 8:30am. 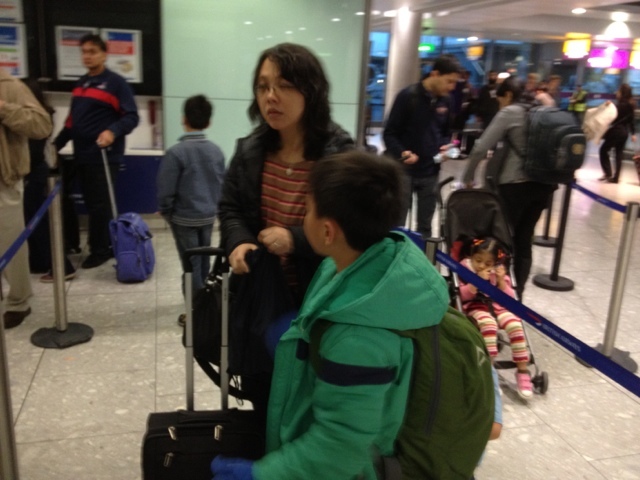 We patiently waited all passengers to disembark the aircraft before we were handed our youngest son Encheng's stroller. This stroller is essential when you travel with young children, especially useful when you have to rush to catch a flight ... You'll understand what I mean later. Marching the troop of boys to the next point, I was looking through the airport window to immerse myself with the early morning moment of London. The sky was overcast, typical of general impressions of London. And London was just waking up to a new day, at the beginning of dawn. Forgot to mention London is much colder than Joburg at this time of the year, at 6 degrees Celsius. You felt the cold in the air. I pushed the stroller with my youngest son into the lift, while the rest of my family used the escalator to get to the lower level for the connecting flight. While in the lift, I mentioned to the fellow passengers I didn't have much time to catch the connecting flight. A British Airways worker informed me that I was going the right direction, and after the security check I would be at B Gates. That gave me a bit of comfort. 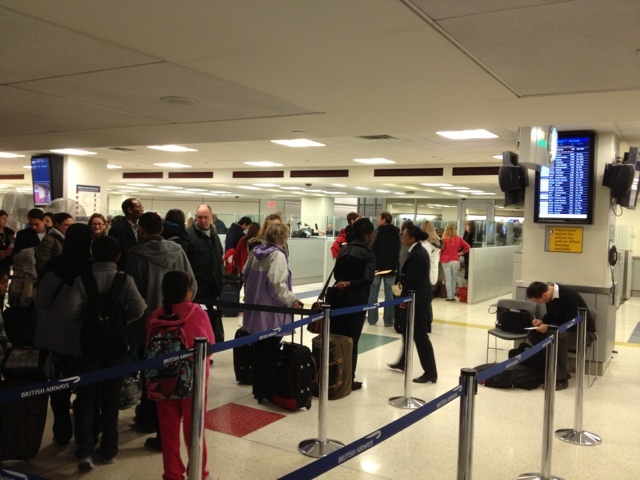 No matter, we had to wait for our turn for our baggages to be inspected. Then, all items were taken out of the baggage one by one, they found a tomato juice can in my second son Enxuan's backpack! That was the culprit that held us back. With a glimmer of hope, we used the escalator to get to the next higher level and searched for Gate 39. We found it and saw some BA staff standing at the check-in point. I ran as fast as I could with Encheng in the stroller, with the rest of my family not far behind. It was such relief to hear a staff member tell me, " you are OK, we are expecting you." it's like a pair competing for the reality show The Amazing Race, reached the final destination in a leg and was told safe to go to the next race! At the end, I was just grateful for BA wait on us, as the last five passengers to join flight BA117, to JFK New York. A tip when you travel internationally: don't have any sharp objects in your hand luggage, no liquids, as they can cause you delays at security check points. Also if you are to go through a security check point at the London Heathrow airport, take out all items as instructed before scanning, or you may end up spending another half an hour. Don't keep the unfinished juices or waters from the previous flight in your hand luggage. My family has learnt it the hard way. It's New York, New York!